Bright spot emerges on Uranus - can amateurs track it (and thus help Hubble)? Observations with one of the Gemini 8-m telescopes show a very bright spot that has suddenly appeared on Uranus and is at least 3 times brighter than the remote planet's disk: "If this is a convectively driven white feature it may evolve to larger size and brighter appearance on the next few days," says an unusual alert message distributed via The Astronomer network earlier today. Moreover amateur images of Uranus are now considered "essential to study this feature and its precise drift rate to assist possible observation with other highly-priority telescopes such as the HST." Uranus subtends 3.7" in the sky, and the bright cloud feature is at least 0.33 arc seconds making this feature potentially accessible to relatively modest telescopes. 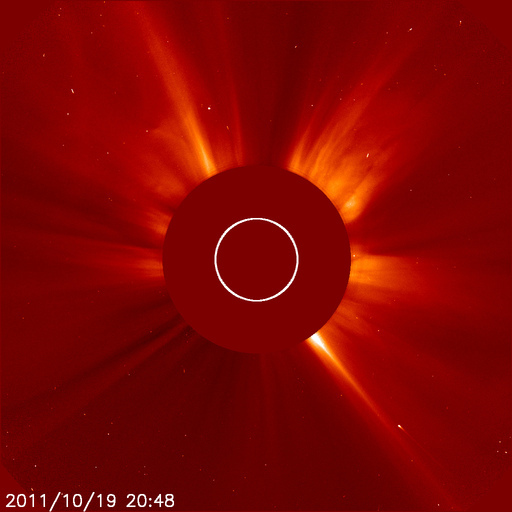 On 2011 October 26 at 08:06 UTC when the linked picture was taken the spot was at 323° west longitude and 22.5° north; the current estimate for the rotation period of this feature is 17.24 hours. • A slightly easier target is Jupiter, now in opposition: selected images from Oct. 24 (46 cm scope), Oct. 22 (20 cm - animation), Oct. 13 (1 meter), Oct. 3 (25 cm) and Sep. 26 (23 cm). Comet Elenin has been recovered after all, now that the Moon is out of the way, but only as an extremely diffuse dust cloud with not one individual fragment brighter than 22.5 mag. : reports on the hunt and what one can see (or rather image) from Oct. 25, Oct 24 (more), Oct. 23 (more), Oct. 21 and Oct. 15, pictures of Oct. 24, Oct. 23 (more, more and with just 8 cm aperture), Oct. 22 (more), Oct. 21 (negative), Oct. 15 (positive after looking hard) and Oct. 14 (negative), another claimed visual observation (why such a small 'coma' size? ), a long essay on visual comet observing - and a very stupid NASA press release asking for Elenin to "be forgotten". Rather forget such dumb advice and observe the most unusual ... thing that Elenin has turned into while it's still possible (it's now receding from both Sun and Earth). In other comet news the first Jupiter Trojan comet has been found - and Bressi may be interesting. • Pictures of Honda-Mrkos-Pajdusakova from Oct. 15, Oct. 7 and Sep. 30 (with a mountain) and Garradd - which now has a nice plasma tail as well! - of Oct. 23 (more), Oct. 17 (more), Oct. 15 (more) and Oct. 14 (more). 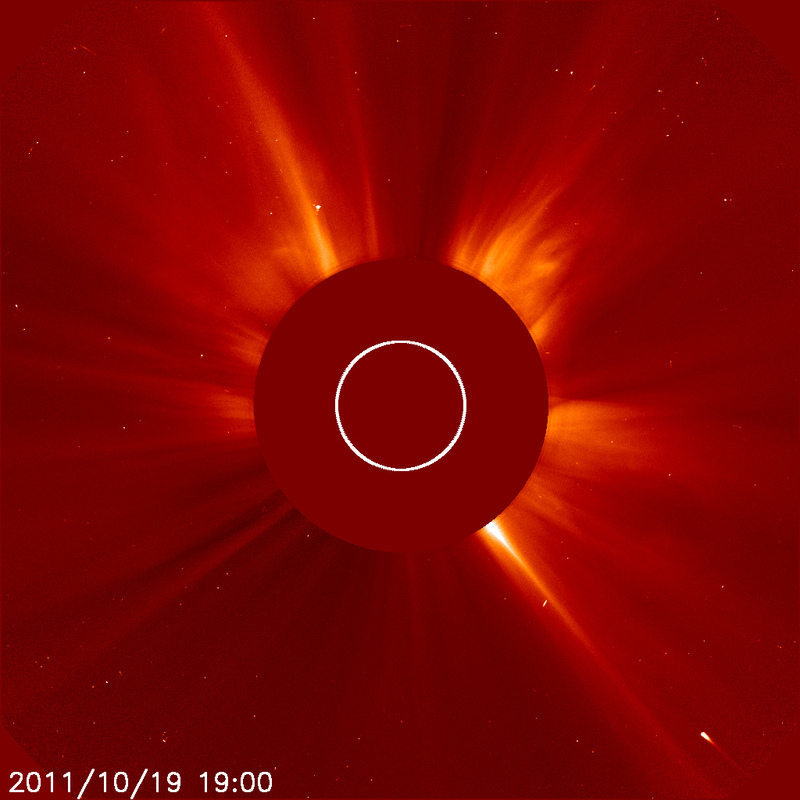 • Another - smaller - comet hit the Sun on Oct. 19 (earlier, still earlier), a video on the Oct. 1 case and 5 years of comets observed by the STEREO mission. • The physics of impacts on Earth, an observing guide for and JPL Release about coming NEO 2005 YU55, an asteroid crossing M 31 (movie) - where it was mistaken for a nova! - and a Subaru Release about Scheila's outburst. In other solar system news Venus and Mercury low in the evening sky on Oct. 24 (USA) and Oct. 22 (Australia and - w/o Mercury - Austria) - the new evening apparition of Venus will end with the solar transit next June! • The equal diameters of Eris & Pluto also discussed here, here, here, here, hier, hier, hier and earlier here. • The Orionids delivered a nice show, only a maximum ZHR of 50, but it looked great for some (another and another night); also an all-sky sum image, a spectrum (more) and a picture. • From the Draconids a detailled story with pictures from the NE German campaign, another video from the NL, observations by ESA, a German video (AVIS2), the radiant from 6 video cameras and a Spanish composite image and report. • Also a night with 5 showers, no evidence for interstellar meteoroids and a German fireball. • This month's full moon was the smallest of the year: a comparision with the biggest one (alt.) and a list of big ones. 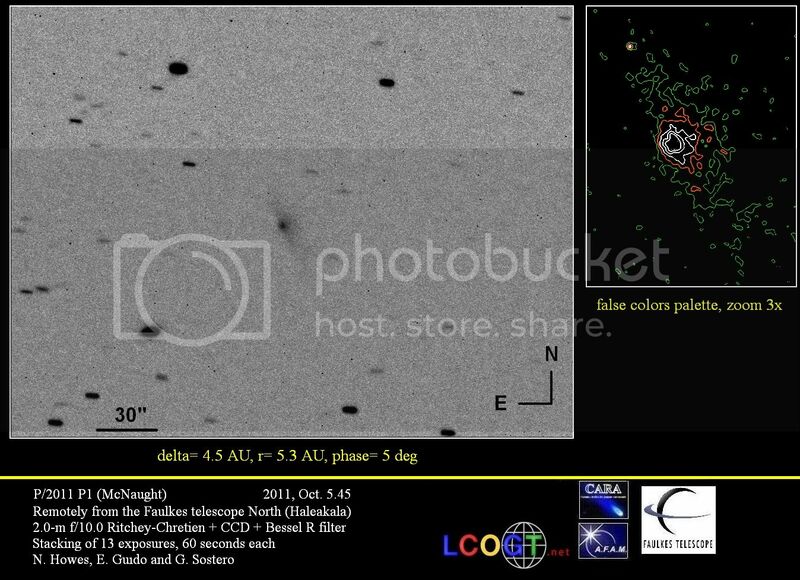 With this negative report, setting tough upper limits on the brightness of whatever may be left of much-expected/hyped/feared comet C/2009 X1 (Elenin) on Oct. 9 and 10 the hunt seemed to be over - yet there are claims that the STEREO satellites can still see it (they probably did in the 2nd half of September; see also this and this tweet) and even of a visual sighting right when the big scopes saw exactly nothing. How could that be? A major mystery right now that puzzles even leading comet gurus ... anyway, this alleged detection of Elenin by Elenin himself (also reported e.g. here [earlier] and here) was probably just noise. Now the Moon is spoiling the view in the morning where the comet - or rather its theoretical positing - is quickly climbing higher; by about Oct. 23 deep observations will again be possible and should settle the issue for good. In other comet news the plasma tail of comet H-M-P continued to amaze: big picture collection and shots of Oct. 11, Oct. 6 (wider), Oct. 5, Oct. 4, Oct. 3 (b/w), Oct. 2 and Oct. 1. 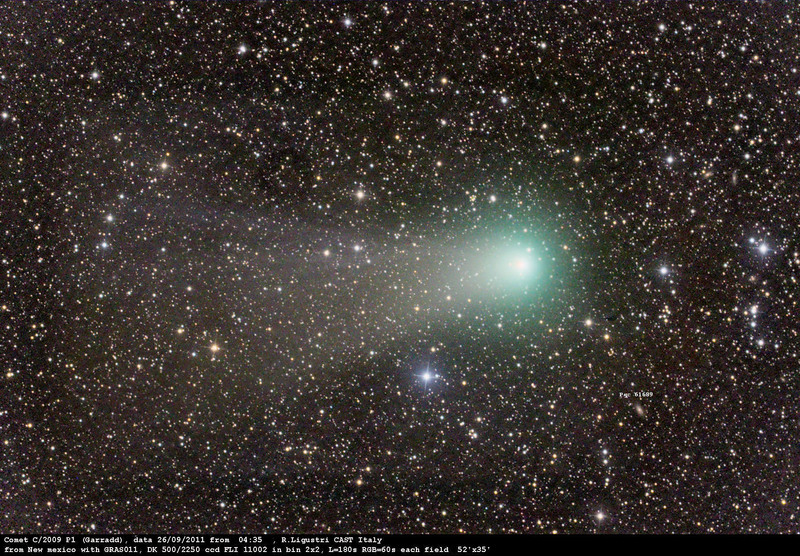 • Comet Garradd on Oct. 10, Oct. 3 and Sep. 29 and the comets C/2011 P1 (McNaught) and C/2011 S2 (Kowalski). • The fate of the Great Kreutz Comet of 2011 - and some funny sungrazer/CME statistics (not proving much yet). • The outburst of Scheila modelled - and modelled again. • The Draconids outburst was covered by a huge live-blog with numerous links; a nice persistent train and meteor. • A meteorite hit a house near Paris in the summer (more, more, mehr), and the complex origin of 2008 TC3 and its meteorites. In other small bodies news a NEO discovery by amateurs 'working for' ESA's Awareness, a call for observations for an upcoming NEO passage, observations of a past one - and more astrometry of Apophis (strangely missing from the JPL analysis of impact risk). • The moons of Minerva (more and more) and an extremely tilted KBO contact binary (more). • The star occultation's outcome was that the diameter of Eris is just like Pluto's (also covered here and here - after some some embargo problems that suddenly evaporated) - and the temperatures on Makemake. In other news Jupiter on Aug. 18 til Oct. 4, Oct. 3, Oct. 2/3 (map) and Oct. 2 (more). • Solar eclipses causing wakes in the atmosphere. • The AAVSO is 100 (from there a 100a of SS Cyg video from this source) and private lightcurves of the SN in M 101. • A quadruple rainbow makes headlines here, here, here, here and here. • A story about Damian Peach, the solar system photographer. 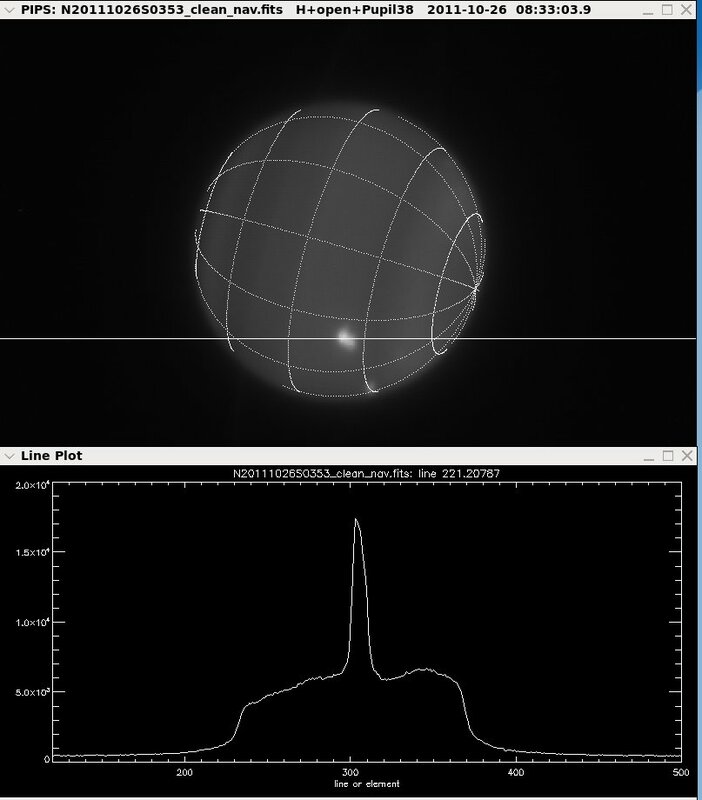 • Observing NanoSail D in hi-res. • A summary brochure of the Decadal Survey. • The world's largest clock dial in Mekka. • And the smallest full moon was obviously smaller than others (more and more) - don't let them tell you that the effect isn't clear to the naked eye! Solar activity is now clearly on the rise, as are space weather effects right here on Earth - and the Activity Regipn 1302 which crossed the disk in recent days (more pictures here, here and here) drove the message home: mainly with a major flare on Sep. 24 that caused a strong geomagnetic storm on Sep. 26 (also discussed here, here, here, here, here and elsewhere). And this, in turn, led to the best aurora of the current cycle, beating the brief August show: some summaries are here (incl. a crappy picture by yours truly; the aurora is the reddish glow on the right), here (more), hier (table) and hier. Further pictures, videos and reports from NRW in Germany (best pix from Bonn) and elsewhere in Germany (more, more, more and more), Austria, Norway (more, more and more), the Netherlands (more), Slovenia, Sweden, Finland, the Outer Hebrides, the U.K. (more, more) and the U.S. (more). There had been another flare on Sep. 22 (more, more and a CME series Sep. 18/9; also the 'secret lives' of flares and a timelapse aurora video from Finland. Elsewhere in the solar system IR Keck images of Neptune and Uranus (more and more), amateur images of Jupiter of Oct. 1, Sep. 26 (also w/8" - and structure on Ganymede!) and Sep. 22, and Mars on Sep. 26. • NEOWISE has revised the statistics of NEOs (alt., ident. ; coverage here, here, here, here and hier) and the history of the Chicxulub impactor (covered here, here, here, here, hier and hier); the latter's role in the dino death is still under debate, by the way. • Among comets there were a bright Kreutz, lots of structure in 45P/H-M-P's tail & Jupiter near-crash (H-M-P today), new main belt comet P/2010 R2 (La Sagra), further fragmentation in 213P/van Ness (more, more), new comet Gibbs, no LASCO sighting of damaged Elenin and a naked-eye sighting of Garradd (which did not fade afterwards); also picture of Sep.30, Sep. 26(! ), Sep. 24 and Sep. 21. Oct. 1-2: Mars passes Praesepe, the star cluster. Oct. 21-22: Peak of the Orionids; less lunar interference than with the Draconids, so worth a look. Oct. 27/8: Conjunction of Moon, Venus and Mercury low in the evening, invisible in higher N latitudes. Oct. 29: Jupiter in opposition with -2.9 mag. ; it's awfully bright already now (closest to Earth on Oct. 27 already).